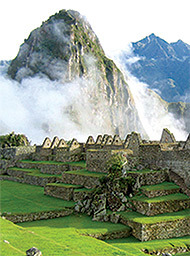 Jourey to Peru with us in 2016 for a magical spiritual & shamanic adventure. The Green Tara College shamanic community join with Wake & Kinlen www.sacredpathways.us to bring together the traditional work of the ancient Andean Qero shamanic traditions of Peru with our own Celtic traditions where the two hearts of both lands speak a very familiar and sacred language. We invite you to join us in this unique opportunity to work with true, open, real indigenous shaman eager to help the world by sharing their unique initations and knowledge. Let the spirit of the mountains and the traditions take your deepest self on this vision quest of deep inner knowing, healing, wisdom and beauty. Peru is a mystical land, where Mountains soar over 20,000 ft, where condors fly, and stones speak. It is home to the Q'ero shaman who link us to our heritage as indigenous souls and Creators. Join us in ceremony with the Q'ero indigenous shaman as part of your Destiny and Heart's Calling. Be a part of the evolving consciousness of the planet as we reach into new awareness and harmony. Be received by the ancient site of Machu Picchu, one of the new Seventh Wonders of the World and other uniquily individual sites in the Sacred Valley. Peru's Sacred Valley holds the sweet energy of Pachamama (Mother Earth in Quechua). You will feel her embrace as soon as you land. She will hold your footsteps steady as you get used to the altitude. And wrap you in community and an internal sense of family. You will be greeted by the Q'ero shaman of the high Andes. 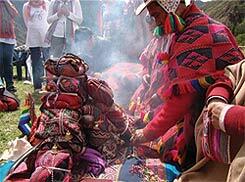 You will offer ceremony on the Sacred Sites of the Inca. You will visit the bustling markets, the weaving communities, and eat the pure foods of this simple farming land. Wake & Kinleen Wheeler USA & Peru. Wake and Kinlen Wheeler have been leading sacred journeys to Peru for the past 10 years. Known for their supportive facilitation, intimate knowing of the sites, as well as the energy medicine of the Andes. We invite you to join the circle going to Peru in 2014. Wake and Kinlen Wheeler create a journey of depth and authenticity, leading groups in Peru, Europe, and Mexico. • Weave spiritual experience with participants, local shaman, and native people. • Create ceremony in world class, as well as, intimate, rustic sites. • Support each individual’s personal pathway of growth and enrichment. Over 20,000 feet, where the condors fly and stones speak. Join us for this beautiful, life changing, Journey and let the palpable energy of the Andes propel your Destiny. 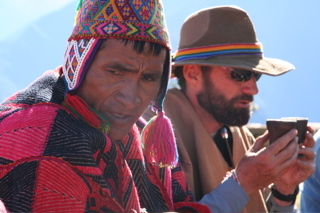 You will be working with the indigenous Shaman to connect our celtic traditions as a gift to the Peruvian traditions. All woven into our time together, and into the growing of our personal medicine. Arrive in Cuzco, settling, drink 1-2 cups of coca tea if desired. 5 pm group meeting in the Lobby, and dinner near hotel. Morning tour of the Coricancha, energetic center of the Inca realm. Visit the Mountain of Sacsayhuaman, Sanctuary of Lightning, overlooking Cuzco, and Opening ceremony with the Q’ero shaman. Experience Killa Rumiyok, a charming ancient site with towering natural stones, rushing waters, and one of the America’s few lunar calendars. Become part of the fertile valley, celebrate in traditional despacho ceremony. Visit Chincheros Weaving Community with Nilda Callanaupa Alvarez, creator of the Center for Traditional Textiles in Cuzco. Celebrate the rebirth of the ancient Andean weaving tradition. These are some of Peru’s finest weavers. Enjoy a traditional Peruvian lunch, before heading off to Pisac’s famous market with stones, crystals, textiles, jewelry. Evening Fire Ceremony at our beautiful retreat center, with views of Pisaq site. Climb the stairways of the Incas. Pisac offers a huge mountain site with trails, temples, and timeless secrets. We will begin at the top fountains, and enjoy the golden falcons living in the burial cliffs near by. Explore the buildings and walkways, until we find the perfect place for co-creative ceremony. Experience the amazing circular terraces and sanctuary of Moray. This is an agricultural sacred site where grains and fruits were raised for experimental and ceremonial use. Flanked by the great Apus (Mountains) and the glacier field of Chigon. Feel the energy at the center, which has been described as a vortex and the womb of Pachamama (Mother Earth). Enter the Inca community of Ollantaytambo where the houses and streets remain in use since Inca times. An ancient aqueduct churns water through the streets. The mountainside site has some of the largest, most finely crafted stones and walls in all of Peru. Consider lying on one of the stones and taking a Spirit Journey. Early train to Machu Picchu, to arrive in time to explore the site in the afternoon light, just as most tourists are leaving. We’ll see all the classic structures with fewer people. Dinner at one of many restaurants in Aguas Callente. Return to Machu Picchu for sunrise, and options for climbing andmeditating in the energy of the site. Visit the Sun Gate, the Inca Bridge, or climb to the top of Huayna Picchu peak, where a spectacular view of mountains awaits (special tickets are needed for this hike). Return train to Ollantatambo. Taking the journey home, for those leaving, there will be a bus to transfer you and your luggage to the Cuzco airport, and return flights, to depart no earlier than 1pm. The Green Tara group offer the opportunity of travelling together from Ireland. When you have secured your place email majella@holistic-training.com and we will add you to our moodle peru trip page where we will all share information etc. I have never done anything like this before can I come along? How will the Irish group organize travel? I would like to learn a little about shamanism before I go along how do I do this? Take any of the green tara college introduction to shamanism days. Join us at Green Tara College for the drumming circles and celtic ceremonies. We have especially trained with the Quero shaman and work to connect all shamanic lineages and traditions creatively with our own celtic powerful landscape. What is your suggestion for the best prepartion for the trip if I would like to prepare? I believe that attending ceremonies and taking part in this years shamanic medicine wheel would be an ideal and amazing way to opening you up to getting the most out of the trip. If I decide not to take the medicine wheel what else is available? Do I need to do personal preparation before the Trip? Absolutely not, the trip itself is a wonderful enlightening experience and you may be happy to join us and be open to the wonderous gifts and learning that will come to you.